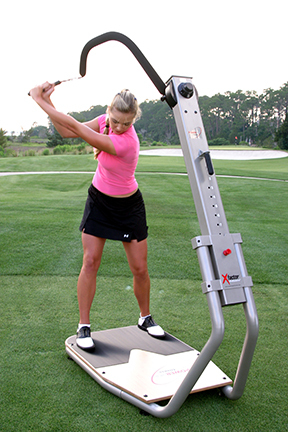 The Golf Fit Swing Master™ by Power Max Fitness is the ultimate one-stop golf improvement station that will help you gain 20-60 yards from the tee, and improve your golf swing. Contrary to popular belief, golf is a contact sport. You make contact with your club and your club makes contact with the ball. And since it is a contact sport you will perform better if your "swing engine" is well tuned, and all that is required to tune and super charge your swing engine is to spend a few minutes a day on the Golf Fit Swing Master™ . This is not voodoo and there are no smoke and mirrors. This is a medically proven fact. By working with this equipment, you will tone, strengthen and rehabilitate the muscles and joints used in an athletic swing motion and you will increase your flexibility, stamina and swing strength. We feel so confident that the Golf Fit Swing Master™ from Power Max Fitness will help you go long and stay in the short grass that we are willing to make a money back guarantee. If you don't feel that you are getting the results you want, just send it back within 30 days of delivery for a full refund of your purchase price. This is the most effective golf training and strengthening station in the world and it will help you play Longer, Better, Straighter Golf.